Max Allegri’s Bianconeri honeymoon was ended by the hands of Diego Simeone’s Atletico Madrid in a close 1-0 battle this week. While Juventus certainly displayed no fear of Atletico, they were beaten on the margins. It’s always the little things that decided a game between two great sides, and Atletico were just that bit better in front of goal, on the challenge, and frankly, in the fouling department. Juventus, while they certainly did well with possession at times, actually struggled to create danger in the final third, leading some to believe that Max had instructed his side to play for a 0-0 draw. 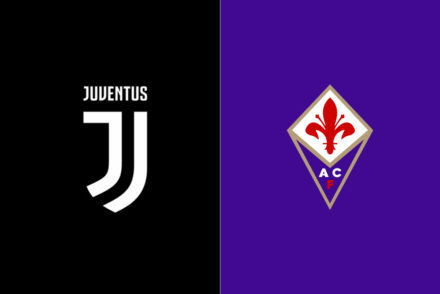 Either way, Juventus now have another big test, perhaps an even bigger one than the match versus Atletico. 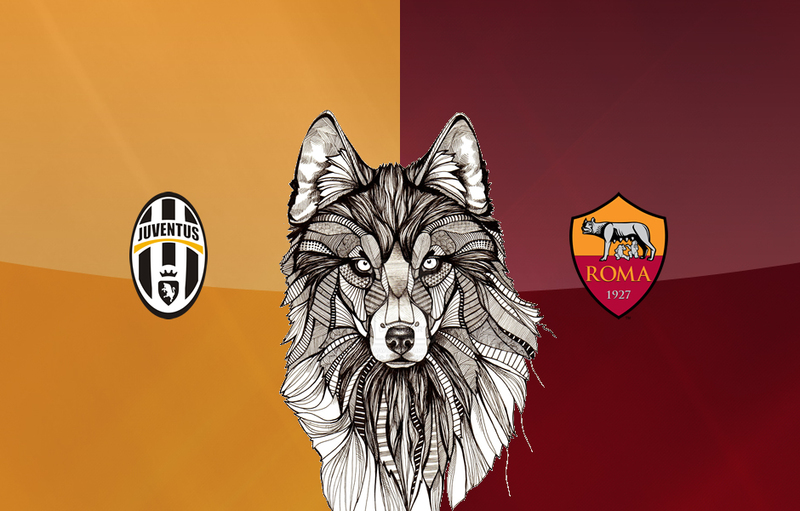 The new – and true – “anti-Juve” aka A.S. Roma, have been on a hot streak since the season started. Allegri will need to have his squad focused on the match, and not fretting about the loss to Atletico. It seems that Allegri has begun to settle on a normal starting lineup, and there are really only a few toss ups in terms of who will start for Juve. Gianluigi Buffon will be in goal of course, while Leonardo Bonucci and Giorgio Chiellini should slot in to their usual positions in the three man backline. Theoretically we could see a four man backline, as Max switched to after Atletico scored, but the 3-5-2 seems to work well in Serie A so it’s likely to stay for this match. The final centerback spot is up in the air, Martin Caceres and Angelo Ogbonna are battling it out for the start. Both are in fine form, although Caceres did dislocate his shoulder in Madrid. One of the trainers popped it back into place on the sideline though, so even if there are issues he should be fine to play. Out wide, Stephan Lichtsteiner is expected to start at right wing back, while as always Asamoah and Evra battle for the left wing back position. I suspect we will see Evra, since Max has been picking him somewhat consistently over Asamoah at LWB, but I hope we get to see Asamoah feature. The midfield should see Paul Pogba and Claudio Marchisio retain their starting roles, though Andrea Pirlo should be on the bench and could see time as a substitute for Marchisio. Then in the “enforcer” role, the battle is between Roberto Pereyra and Arturo Vidal. Vidal is the favorite based on class, but Pereyra has been in fine form since joining Juve, in fact he has played better than Vidal has this season. Still, Vidal, due to his recent knee injury, could receive the benefit of the doubt and start again. Either choice has its’ merits. There seems to be little question that Fernando Llorente and Carlos Tevez will start as the strikers. Though one begins to wonder how long Llorente can retain his starting spot with his current form. Tevez, on the other hand, has been Juve’s main attacking outlet, just as he was last season. I also expect to see one or both of the pair of Alvaro Morata and Sebastian Giovinco see time as a sub. Morata has had an encouraging start at Juve, especially given his initial injury, while Giovinco could be on the cusp of a mini-renaissance under Allegri. Juventus will need her starters in top form for this showdown with Roma. At this point, I think that everybody knows that Roma is a very good football team. 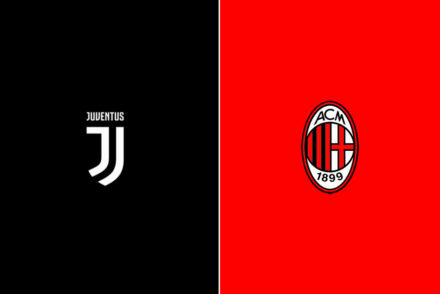 They have probably the best coach in Serie A and they have a complete squad with at least two valuable players in every position. 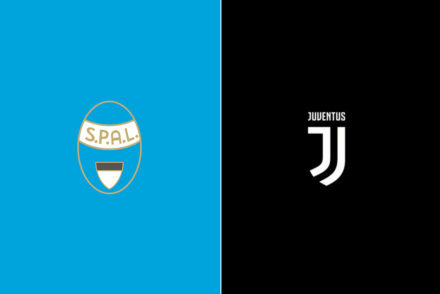 They got off a brilliant start in Serie A and Champions League and they travel to Turin with loads of enthusiasm and desire to launch an important signal in the Scudetto race. They come to the Juventus stadium with a depleted squad, but the many absences shouldn’t affect the quality of the lineup too much. Daniele De Rossi (calf strain) and Davide Astori (LCL strain) will definitely miss the game, along with the long-term injured Kevin Strootman (ACL tear) and Federico Balzaretti. Leandro Castan hasn’t played in a while due to a nagging muscular issue: he’s likely to be sidelined too. Marco Borriello and Salih Ucan join the long list of unavailable players. Morgan De Sanctis is questionable too but Lukas Skorupski is a talented goalkeeper, even if he’s still raw. Roma are without two centre-backs, but they haven’t suffered: Konstantinos Manolas has been commanding and Yanga-Mbiwa, despite looking a bit shaky at first, has been serviceable. Maicon, despite the national team’s controversy, has been his usual self. Ashley Cole hasn’t been particularly brilliant, but he remains a very experienced fullback. Against Juventus, Rudi Garcia will probably field Francesco Totti and Gervinho. Iturbe has just returned from an injury: we’ll see who’ll be selected among him, Destro and Adem Ljajic. The choices midfielder are obliged: Miralem Pjanic-Seydou Keita-Radja Nainggolan. Keita is definitely not a defensive powerhouse like De Rossi, but he’s physical, technical and has played in the biggest stages: definitely a smart signing, considering that he was a free agent. Besides the lineup, which could be change due to some natural rotations, it will be very interesting to see what strategy Garcia will deploy. In the past season, Roma played against Juventus twice in January. 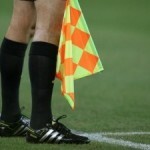 In the first game in Turin, they faced Juventus head-on, without altering their usual tactic. And they got trashed: 3-0. It was a fluky 3-0 with a penalty and two red cards in the final minutes because Roma basically lost it, but a convincing win nonetheless. 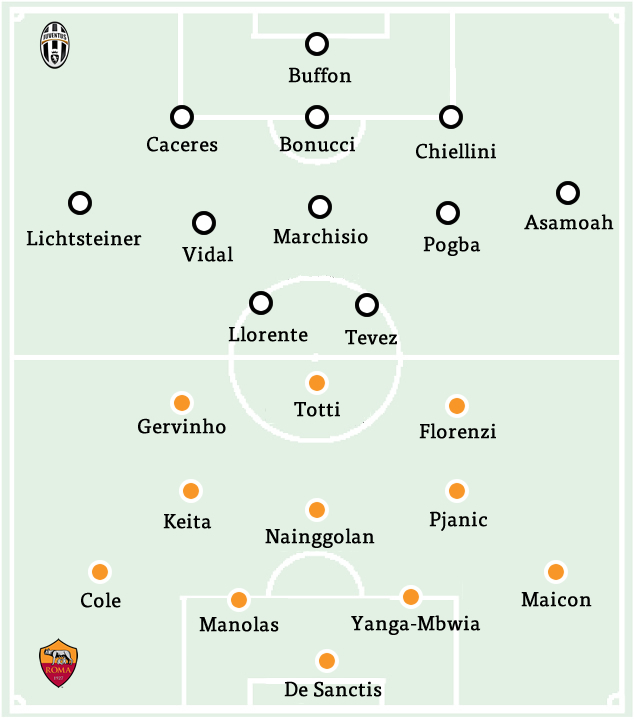 A couple of weeks later, Juventus and Roma squared off at the Olimpico in a Coppa Italia game. Roma were more conservative: they sit back and countered, they didn’t attack with too many players and were always very focused on the defensive phase. They played at a slower rhythm, crowding the spaces when they didn’t have the ball. Not only they won the game thanks to a Gervinho goal on a counter-attack, but Juventus didn’t have a single shot on target in that game. We’ll see whether Roma have treasured that match and will use the same tactic or if, considering their excellent form, the extra motivations and the enthusiasm surrounding the team, they’ll won’t be that careful.